I knew the story of Thanksgiving was false. The mythological tale of a cross cultural potluck between a group of pilgrims and their “Indian” hosts was merely a story perpetuated to soothe the trans-generational and communal manifestation of complex Perpetuation Induced Traumatic Stress that is easily observed in a vast majority of white Americans. Socrates notes that “the doer of injustice is more miserable than the sufferer”. And I like to remind people that you cannot build a nation on 500 years of dehumanizing injustice without traumatizing yourself. President Lincoln begins with what seems on the surface to be a standard offering of thanks. The past year “has been filled with the blessings of fruitful fields and healthful skies.” And he does not want to “forget the source from which they come.” He then goes on to note that “others have been added.” And this is where his thanksgiving proclamation becomes problematic. The “others” that have been added refers to the bounties of “fruitful fields”. He’s referring to lands. Lands have been added. In February of 1863, just 8 months prior to his Thanksgiving proclamation, Abraham Lincoln personally signed a bill which nullified the treaties with the tribes in the state of Minnesota. And in March of that same year, he signed another bill which granted him the authority, without treaty or negotiation, to remove the tribes from the state of Minnesota. 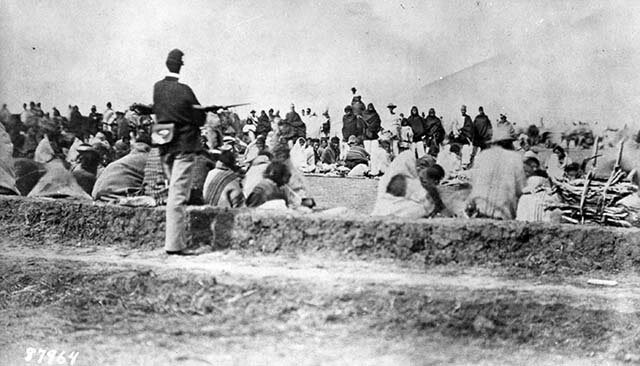 That removal began in April and the Dakota, Winnebago and other tribes were rounded up, held prisoner at Fort Snelling (near current day Minneapolis) and then loaded on to barges, ships and trains and removed to the Crow Creek reservation which had been established in the Dakota territories east of Minnesota. The removal itself was inhumane, and Crow Creek was not sustainable for so many people. 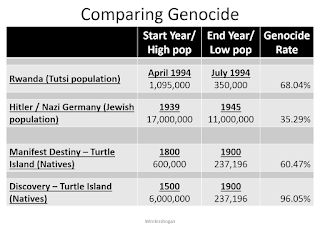 Both deficiencies resulted in the death of many Dakota and Winnebago people. Outside the military theater of the Civil War, another war was taking place where laws (and treaties) were NOT being “respected and obeyed” and harmony had not “prevailed.” Unless you call the hanging of the Dakota 38 and the ethnic cleansing of the Dakota and Winnebago from the state of Minnesota harmonious. Both event took place in the year for which Abraham Lincoln was giving thanks. Beginning in the fall of 1863, and in accordance with the policies of the Lincoln Administration, US Army Officer Kit Carson traversed the lands of the southwest. He burned our homes, slaughtered our livestock and destroyed our crops. Ultimately, he rounded up ten thousand Navajo men, women and children who were then forcibly marched to Bosque Redondo. Hundreds died of exposure and starvation along the route and nearly a quarter of our people died while imprisoned at this death camp. The creation of this camp was personally approved by Abraham Lincoln. Just to be clear, in 1863 “the axe” did not “enlarge the borders of [US] settlements”. 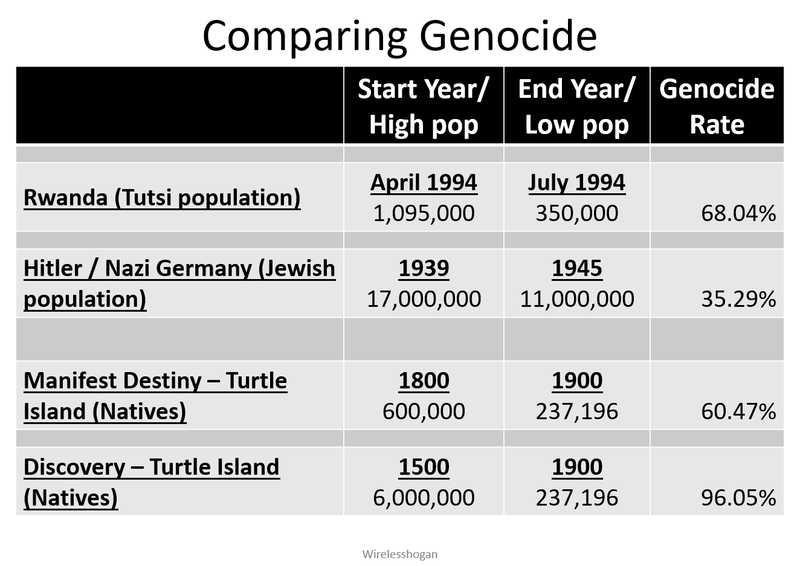 The ethnic cleansing and genocidal policies of President Abraham Lincoln did. At the start of the 19th Century the population of the United States was 5.3 million. By the end of the 19th Century the US population had ballooned to 76.3 million. Abraham Lincoln was correct, but in all honesty, the US population had not only “steadily increased” but it was greatly multiplying (by a factor of 14). However, this stat only tells half the story. 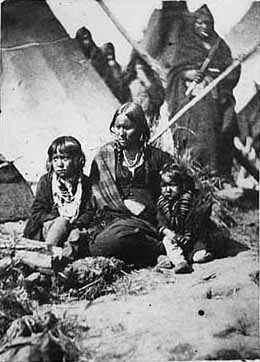 For also in the 19th Century the population of native people in the US plummeted from 600,000 to 237,000. For those who are keeping track, that is a decrease of 60%. In 1863, Abraham Lincoln established a national day of Thanksgiving while his own ethnic cleansing policies and wars were contributing to a genocide rate in the 19th Century of over 60%. That is not only unconscionable but akin to Adolf Hitler declaring a day of National Thanksgiving during the height of the Holocaust. So I’m done. I am no longer interested in reclaiming the US holiday known as “Thanksgiving”. From here on out, the fourth Thursday in November is set aside as a day of mourning. A day of lament. But I am not mourning the genocide of our native people. I lament that travesty on other days; such as Columbus Day, the Fourth of July, Memorial Day, Presidents Day and Lincoln’s birthday. From now on, in my calendar, the fourth Thursday in November is reserved to mourn the fact that we live in a country that, in 1863, established a national day of Thanksgiving for fruits of a genocide we were actively committing. And that is an opportunity for Thanksgiving that I am both morally and spiritually obligated to decline. Mark Charles (Navajo) serves as the Washington DC correspondent for Native News Online and is the author of the popular blog “Reflections from the Hogan.” His writings are regularly published by Native News Online in a column titled “A Native Perspective” which addresses news directly affecting Indian Country as well as offering a Native perspective on national and global news stories. Mark is active on Facebook, Twitter,YouTube andInstagram under the username: wirelesshogan. Great article. My family never celebrated this day. My Grandfather always said he was grateful to be alive after forced boarding school at Chilocco after the murder of both parents in Oklahoma for their oil rich lands.